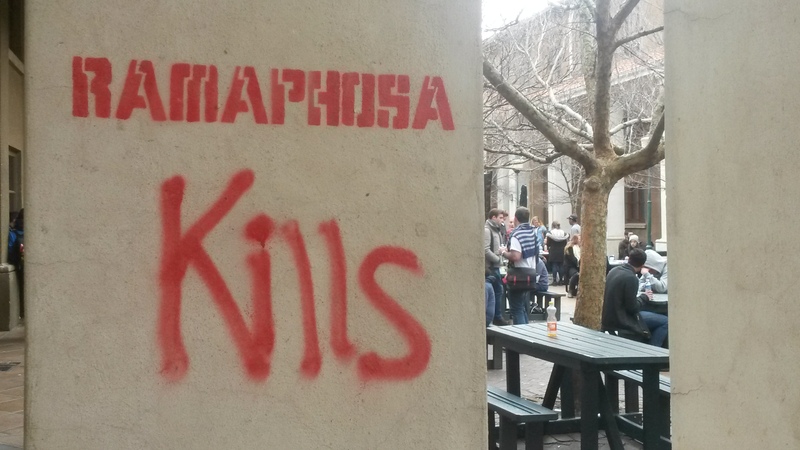 Tokolos Stencils art collective targetted UCT on the anniversary of the Marikana massacre. ANA. The University of Cape Town has rejected outright a claim by Tokolos Stencils that UCT would interfere with their freedom of expression via Facebook. “We invite the members of Tokolos Stencil to provide evidence for their claim as we consider this to be a serious charge,” the university said in a statement. On Friday, guerrilla art collective Tokolos Stencils cried censorship after Facebook closed its account on the basis that it is “not a real person”. The group said it believed UCT had prevailed on Facebook to block it from the social media forum in response to its graffiti campaign on the campus to mark the third anniversary of the 2012 Marikana shooting and protest over the UCT Retirement Fund’s shareholding in miningcompany Lonmin to the tune R9.5 million. “On Monday, exactly one week after our radical action on the campus of the University of Cape Town in which we made known UCT’s collusion with white monopoly capital, and in particular Lonmin (#LonminHasBloodOnItsHands), Tokolos Stencils’ Facebook account was taken down by Facebook authorities,” the group said in an email. “This is an act of censorship. Facebook has colluded with our haters to censor our work and our voice,” it said. The Tokolos Stencils Facebook page was fully operational on Sunday.